A pinch of amchoor powder. Make a thin paste out of cornflour, and add the spices to it. 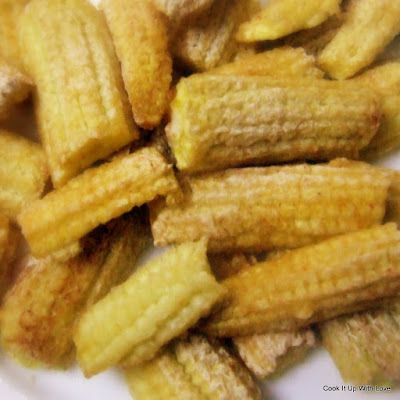 Slit the baby corn into french fry-sized pieces. Pour the paste on the baby corns, and let it soak for around 15 minutes. Pre-heat the oven at 175 degrees for 10 minutes. Place the marinated baby corns one by one in a greased baking tray. Instead of greasing, you can also place a baking sheet on the baking tray. Bake in the OTG at 175 degrees for 5 minutes. Then change the mode to "Toast", for around 5 minutes, so that the outer layer becomes crispy. Remove from OTG, let it cool for around 10 minutes. This entry was posted in OTG Recipes, Snacks and Starters . Bookmark the permalink.